You pop meat straight from the fridge into the oven or onto the grill. Result: Food cooks unevenly: The outside is overdone, the inside rare or raw. Meats will cook much more evenly if you allow them to stand at room temperature for 15 to 30 minutes (depending on the size of the cut) to take the chill off. A roast that goes into the oven refrigerator-cold will likely yield a piece of meat that is overcooked on the outside and undercooked at the center. As you slice the roast, you’ll see a bull’s-eye effect: The middle is rare (or even raw) while the outside is well done. This is less of a problem with smaller cuts like chicken breasts―though even those benefit from resting at room temperature for five or 10 minutes before cooking. 1. 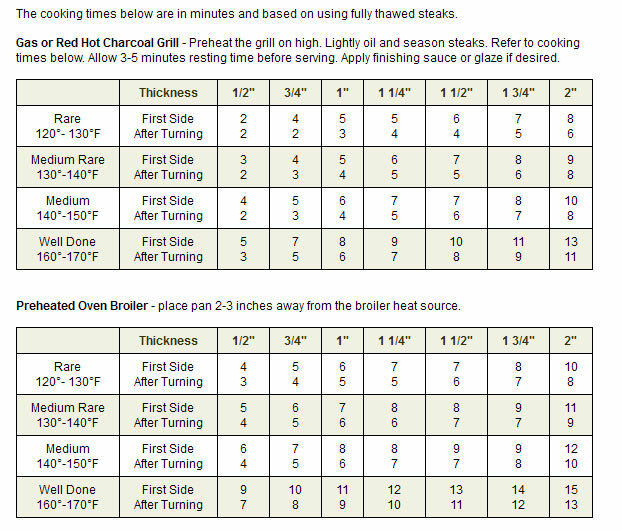 Never begin with a stone-cold steak: The outer portions will overcook by the time the center comes up to temperature. Instead, remove the meat from the refrigerator, liberally season it with salt and pepper, and let it sit at room temperature for at least 30 minutes before cooking. 2. When it's time to cook, high heat is key: Large amounts of energy are required to alter the structure of the surface proteins, and that's what produces complex flavor and a caramelized crust. It's also best to use a cast-iron skillet or other heavy-duty pan that will retain heat evenly. Brush the skillet lightly with vegetable oil and keep it on the stove until wisps of smoke rise from the surface. Place the steak in the center and sear it well on the top, bottom, and edges. 3. To test doneness, use the point of a sharp knife to nick the steak and assess the color inside: red for rare, rosy-pink for medium rare. 4. When the steak is nearly done, you may opt to drop a knob of butter and a few dashes of Worcestershire sauce into the pan and baste the meat continuously. The hot fat will enrich the exterior crust and lend the finished steak an appealing luster. 5. Before you dig in, allow the steak to rest for 5 to 10 minutes, depending on the size of the cut; this will allow the juices to redistribute, for a more luscious steak. To serve, sprinkle the steak with coarse salt and cracked black pepper. Apply Rub: While the grill preheats apply rub/marinade of choice. Remember that if you plan to use a marinade you will need at least an 30 minutes for the steak to soak in the marinade. Our leanest, most tender cut of beef. The cut comes from the Tenderloin of the cattle, a small internal muscle in cattle that is quite frankly, never used. This creates beef that is supreme in tenderness and has a tendency to melt in your mouth. The filet is the leanest of steaks, and also contains less marbling. Since the tenderloin is such a small muscle, and the Filet is so highly demanded, the price is typically very high. This steak is perfect for an elegant occasion or romantic evening. It screams luxury and beauty. The Filet usually takes to marinade very well, so limit the marination time, and limit grilling time. This steak is best enjoyed medium-rare, as overcooking will especially dry out this cut. Exceptionally marbled and tender. This steak is cut from the Strip Loin. It is probably the second most popular steak in America. It is a great size (average is about 12 oz), has moderate marbling and tenderness, is easily marinated, and has a terrific and abundant flavor. It is recommended that you grill to medium or rarer, to retain moisture. This is the steak of choice for everyday grilling and casual meals. It is more price efficient and delivers quite a bang for the buck. Put the two previous steaks together (Filet + Strip), and keep the T-Shaped bone separating the two, and the result is a T-Bone Steak. When cut with a more generous filet, you have a Porterhouse. The name of this steak is derived from the shape of the bone separating two delicious types of beef, strip and tenderloin and the main difference between a porterhouse and TBone is the size of the tenderloin. When grilling, keep in mind that the tenderloin will cook slightly faster than the strip, and the beef closest to the bone will be rarer than the rest of the steak. Utilizing the hotter edge of the grill to cook the Strip, and the relatively cooler edge of the grill for the Filet should even things out a bit. If it’s a bone-in Ribeye Steak, chances are its being called a Cowboy Steak. This name was given to the steak for its boldness, style, and tremendous flavor. The Ribeye is highly marbled and less lean than the filet, creating an exceptionally juicy and flavorful piece of meat. This steak is cut from the beef rib. Many beef connoisseurs say that this is their steak of choice. Best when grilled on high. Can be grilled to medium while still retaining moisture and juices. Save this hearty steak for a cookout at the football game, or impress the neighborhood gents. Prices are moderate. Bursting with bold flavors. This muscle is typically worked more than other muscles of the cattle. This cut, in general, is less tender, but go with the Top Sirloin and you won’t be disappointed one bit. The Top Sirloin is more tender than cuts from the bottom sirloin. Moderate prices, and retainment of flavor and tenderness makes the Top Sirloin a perfect steak for large gatherings and cookouts. Grill to medium or rarer. Marinate for a few hours for added flavor.